Jamis has been making bikes with 27.5-inch wheels longer than most brands, so we had high expectations of the company’s new cross-country whip, the Dakar XCT 650 Team. In this video, our testers debate whether the bike lives up to its promise. Final Take: A seasoned fighter in the 650b ring with some new moves. 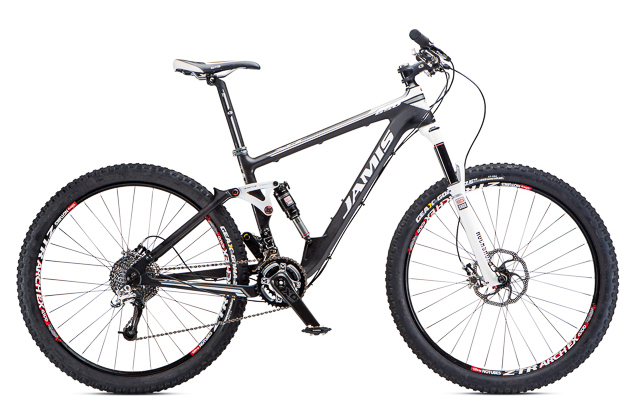 Jamis has been making bikes with 27.5-inch wheels longer than most brands. For 2014, it has added 10 new models, and our XCT Team test bike is perched right on top of the heap. With five years of refinement behind it, this bike is ready to tangle. The XCT has an impressive component spec. Full X0 drivetrain, X0 brakes—the product manager even opted for the blingy silver version, which contrasted nicely with the flat-black paint job. RockShox handles suspension duties with a Revelation RCT3 up front and a Monarch RT3 high-volume shock out back. Stan's ZTR Arch wheelset rounds out the package. The cockpit had us scratching our heads a bit, though, which we could almost do with our hands still on the bars since the combination of the tallish headtube and the rise of the Crankbrothers bar/stem setup had the handlebars up in "Easy Rider" territory. Looking for reviews of the most promising mountain bikes for the 2014 season? Bike magazine's fifth-annual Bible of Bike Tests is the mountain-bike world's most comprehensive gear guide, with honest, balanced reviews of 34 new models. Each review is a consensus of our seasoned crew of testers, who put every bike through its paces on the challenging trails of Sedona, Arizona. We've also included a video of our often-heated 'Roundtable Reels' discussions on each bike to give you a clearer idea of what each tester thought. Expect the unexpected.